The Book Rat: Helluva Halloween Options - need your help! So yeah, I'm going to be hosting Helluva Halloween III. I don't know quite how it will compare to previous years because I'm still deciding how much I want to do. But I am going to be using books I own and have been dying to read. But um...there are a lot of them. What I want from you: below, you'll see a picture of some of the books I'm considering, plus a list of a few more that didn't make it into the picture. (If you subscribe to me on youtube, there is a corresponding video.) Please let me know which titles you'd like to see be a part of the event. I don't just mean which titles will be reviewed, either - which authors would you most like me to try to get involved? Which books would you most like to be given away? want them included in some way. So leave me a comment (please, pretty please) with a few of the titles you'd most like to see. You're also welcome to make suggestions, and I will certainly consider them. Also, if you'd like to be involved in some way, email me your idea and I will get back to you! I vote for Hex Hall. I love witchy tales around Halloween. I loved Lips Touch Three Times, so eerie and beautiful! I myself also want to read The Monstrumologist and The Demon-Trapper's Daughter. Maybe I'll read and review them in tribute to your feature! Ooo, great picks. I'd say some of the ones I most want to see involved are Chime, Hex Hall, The Monstrumologist and The Body Finder. Otherwise it's be great to see those other books featured, but I totally get it if you don't have the time. I'd love to see Hourglass, Enclave, Witch Song, Dead Beautiful and Clarity! I'd also say the Hex Hall series because seriously, if people haven't read that yet, they NEED to. I think Hex Hall and The Demon Trapper's Daughter would be good in your feature. 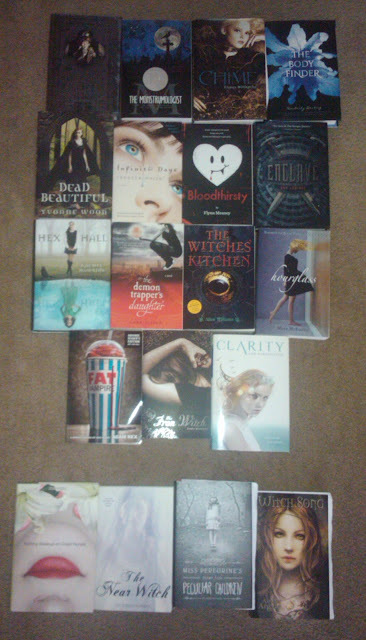 I think The Body Finder and The Near Witch are a MUST READ for sure :) Enclave was fabulous and it could work, too, although it's more like a dystopian novel than a horror (but hey, it's kind of like I Am Legend or 28 Days Later, so maybe it could work after all!). I also suggest Imaginary Girls by Nova Ren Suma - pretty creepy and horrorsque. And maybe some of the classic retellings, like Pride and prejudice and Zombies or Abraham Lincoln the Vampire Slayer? Hex Hall and Hourglass would be great ideas for this! Wow, what a selection. I liked The Body Finder, heard a lot of good stuff about Hex Hall. from your "also considering" list...I say Anna Dressed in Blood - only because it sounds awesome and seems to be one of the most applicable books towards Halloween. I'd like to see Clarity, Dead Beautiful, and Miss Peregrine's Home for Peculiar Children included in some way. Hex Hall and Hourglass definitely have my vote! I think you could skip Dead Tossed Waves. It's a time sucker. =/ BUT, you gotta add Fat Vampire! That book just sounds great. The whole idea behind an overweight teenage vampire is priceless. I've also heard that The Demon Trapper's Daughter is pretty good. I haven't read it though. I think I'm most interested in The Monstrumologist and Miss Peregrine's Home for Peculiar Children. So glad you've decided to host this again this year. I always enjoy it! You have got to read The Monstrumologist. It spooked the hell out of me. I mean it. I don't know much about the others, but I did see Rachel Hawkins speak at the Decatur Book Festival last year and I think she would be great to approach for an author interview. She seemed to be a lot of fun. also sounds like they might fit in with your theme. Hourglass, Dead Beautiful, The Demon Trapper's Daughter, Clarity and The Iron Witch (plus the 4 definite books) are what I'd like to see included in any way possible. Really loving your list. I actually have a few of these books and plan on purchasing some more...darn you and your wonderful suggestions ;). It's not YA, but I would like to suggest the super creepy Faerie Tale by Raymond E. Feist. I narrowed down the list to the following titles. I would love to see all of these but I am putting stars next to the ones that I am most excited about. **Wolfsbane by Andrea Cremer (I despise this cover, but I want to read the series, blarg). Fat Vampire, Marbury Lens and Wolfsbane would be my picks. Monstrumologist, Marbury Lens, Daughter of Smoke and Bone (this one is out in September so you should be able to pick it up by then? ), and Dead Beautiful!